In this case, my bologna (or buh-LOG-na, if you so desire) doesn’t have a first name because it’s made by “Ford Gum and Machine Company, Inc.” in Akron, New York, though actually produced in the People’s Republic of China. Even though it’s made up of “sugar, gum base, corn syrup, talcum powder, corn starch, artificial flavor, glycerin, citric acid, soy lecithin, malic acid, artificial colors (including red 40) and BHT” they decided to cleverly steal imitate Oscar Mayer’s classic packaging, perhaps in the hopes that someone would see an unrefrigerated package of meat on a shelf and eagerly pick it up. 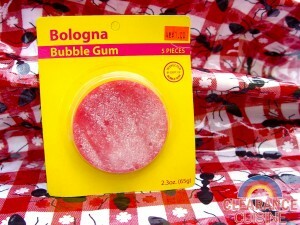 Bologna Bubble Gum actually made its debut in January 2007, along with a Hot Dog shaped variety (as if you weren’t excited about eating hot dogs before!) 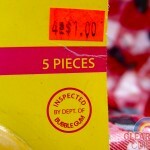 though now it looks like the 7 slices of the gum that were originally included have been whittled down to a paltry 5. Tough times in the gum industry call for tough measures. They’ve even removed the original tag line “Blow your lunch!” from the packaging, though that may have been for entirely different reasons. 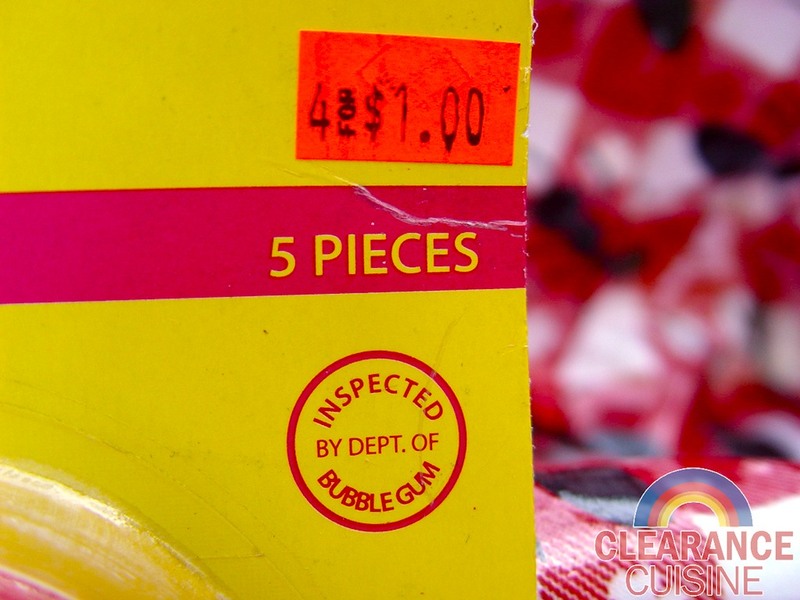 Even though regular processed meat products have to go through a strict regimen of food safety tests, the fine people at the Department of Bubble Gum have got this one covered. Though I’m not sure what their exact testing guidelines are, as I came to realize, it’s probably not that much. As I opened the package and carefully slipped out one of the leathery and powdery pink discs, part of me started to wish I had chosen to review actual bologna, despite my dislike of it. It was kind of a worrisome sign when had to awkwardly yank and tear at the circle to get a sample piece, so I decided to just take a bite. I personally consider myself somewhat of a gum aficionado so this product left me sadly disappointed. The pieces were dry and gritty (even after chewing a piece for a few minutes), and not to mention, chalky due to the talc powder liberally applied to the surface. Though there was no mention on the package of what the actual flavor was supposed to be, I would describe it as “old crackly watermelon”. One of my primary reasons for enjoying bubble gum is my ability to rapidly inflate it with my mouth to have it pop and leave me picking sticky bits off of my face, so since this gum was lacking any sort of elasticity (in fact, it was mostly crumbling in my mouth and didn’t stay together), I spit it out after about a minute. If this experience has taught me anything, it’s that novelty packages are not to be trusted and will most likely let you down in the end (same goes for online dating profiles). However, it has shown me that a spiffy press release and some clever marketing lingo can make any product sound appealing. Steve Greene, Vice President of Sales & Marketing for Ford Gum says, “Retailers now recognize that adding new & innovative fad candies to their mix keeps kids coming back to check out the candy aisle for the newest & coolest items…packaging is essential to a novelty candy product’s success.” If anything, marketing terrible food products is like being a criminal defense lawyer, without any of the guilt of defending a potential murderer, only horrible tasting food and drinks. And those never killed anyone (except for all of that E. Coli infected bologna). 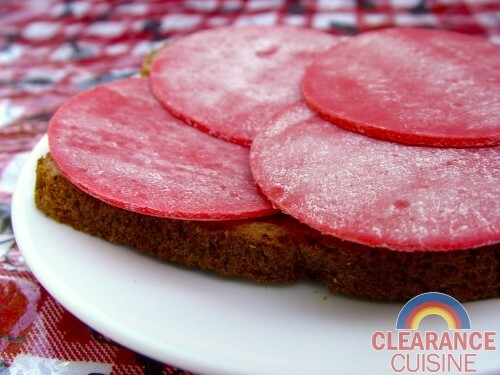 This entry was posted on Monday, July 25th, 2011 at 8:00 am	and is filed under Food. You can follow any comments to this entry through the RSS 2.0 feed. Both comments and pings are currently closed.